I am learning the French language so I just bought Text Speaker with the voice of Céline in French. When I try to use the application, it opens in English, but not in French. What can I do to use it in French? You can change the language in which the application interface is displayed in Text Speaker. When the language is changed, the Menus, Dialog boxes and Window titles will be displayed in the selected language. To change the language of the application, click Tools >> Settings. 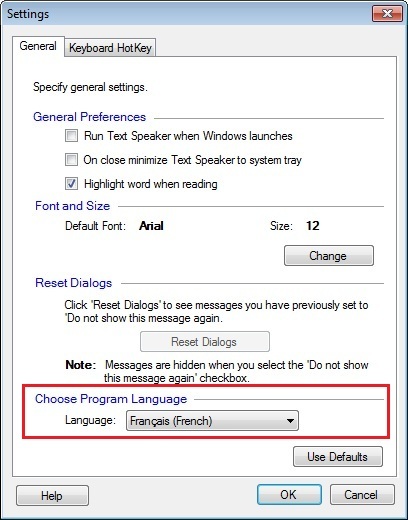 Then select the program language as French from the Language dropdown. Click Ok to save the settings. Now, when you launch the application it will open in French.